Morten Rønningen - Kobelco Construction Machinery Europe B.V.
Norway is a country that forms part of Scandinavia, more commonly known as the Nordic countries. Its north region is of high latitude and subject to subarctic weather, but its southern region is also prone to being blessed with white gold that is snow – so-called white gold because snow brings so much joy to thousands of Norwegians. Norwegians love to ski. From an early age they are taught to ski because they have more than their share of beautiful snow-topped mountains. In peak skiing season, Norway is an ideal playground for thousands of ski worshippers from around the world; young and old, new and experienced. As a sport and social exercise, skiing as a leisure pursuit is increasing and with it, the urgent need for holiday homes and vacation accommodation. Preparing footings for houses and cutting new access routes in remote areas requires specialist, reliable workhorse-like machinery that can deal with the cold, granite rock formation and many hours of darkness in the winter months. Bjørn Baastad AS is one such company that specialises in civil engineering including remote ground preparation. 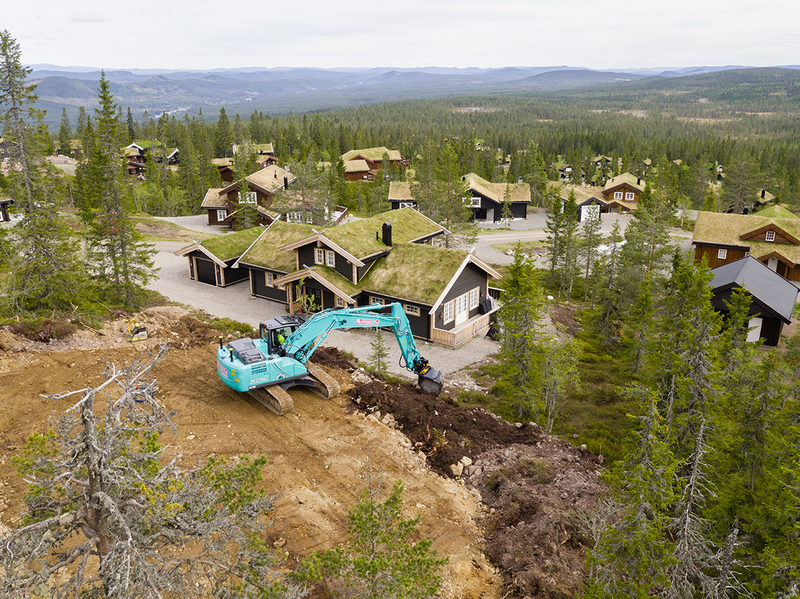 Bjørn Baastad is currently working on a project at a renowned ski resort in Trysil, a municipality in Hedmark, Norway. 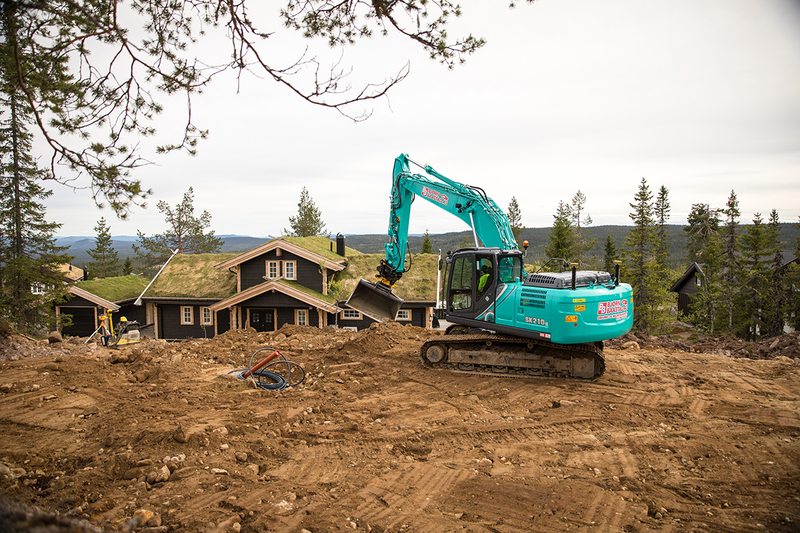 For this specialist work, Bjørn Baastad has just taken delivery of a new Kobelco SK210LC-10. Approaching the ground site, it’s difficult not to spot the operator of the immaculate SK210LC-10 – he has a wide smile and is standing by the side of the Entrack dealer-supplied machine. Like most Norwegians, he delivers a courteous hello in near-perfect English, followed with: “I’m not sure I can tell you much, I have only had the machine three days!” That smile gets bigger. 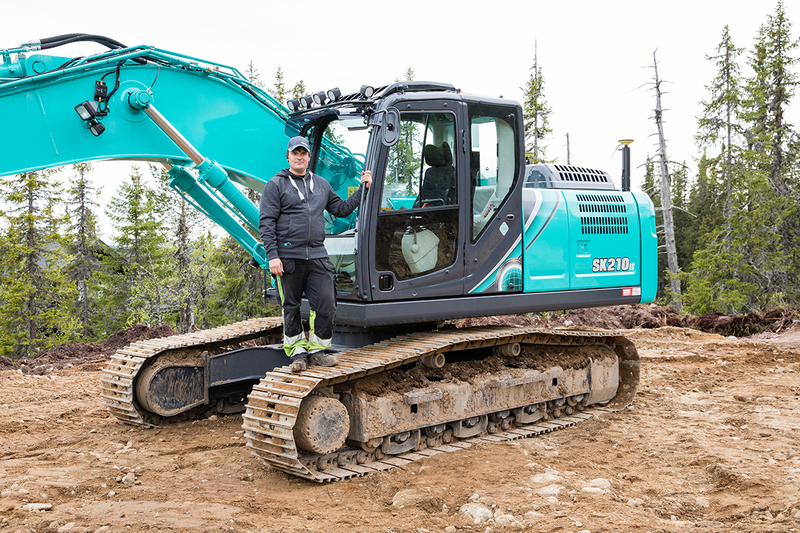 ”There are two views of why Bjørn Baastad AS purchased the Kobelco SK210LC-10. From Morten’s side it was because he tried it out before the purchase and he was very happy with it, so he gave Bjørn (the company owner) the thumbs up. “I actually wanted a Volvo,” says Morten, “because I’ve driven one for so long. 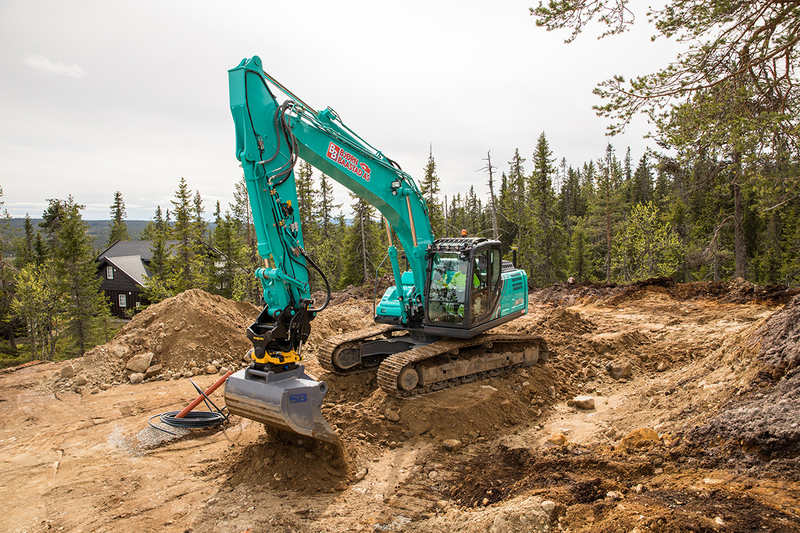 But when I tried the Kobelco it was nice – nice means it’s quiet, the driver environment is very good when working eight-10 hours or more, plus the visibility is very good especially with the side and rear cameras. It is quiet inside so using the telephone is not a problem. Listening to music is also ok – there is no FM here in Norway so an adaptor for DAB had to be fitted. I haven’t used the air-con cooling yet because it’s been so cold, but the climate system is fine. ”Bjørn Baastad, the man behind the company, shares the same purchase decision view but includes other factors. 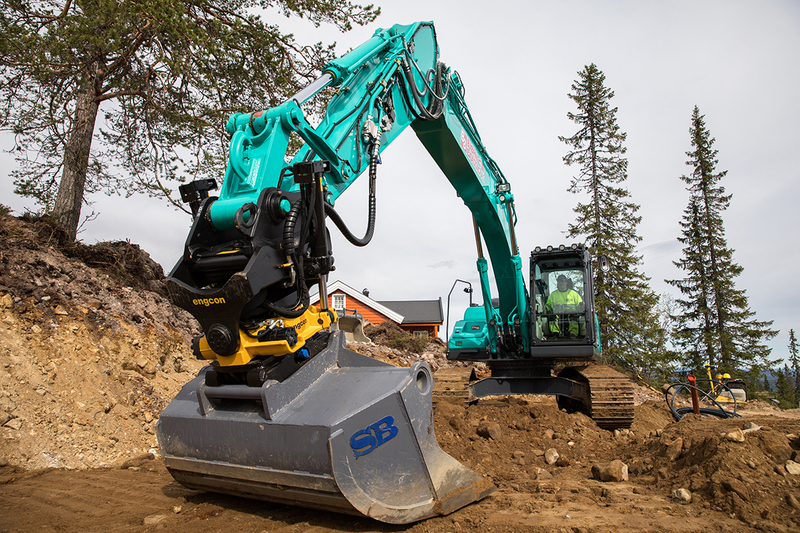 “We looked at Hyundai, Volvo and this Kobelco,” he explains. 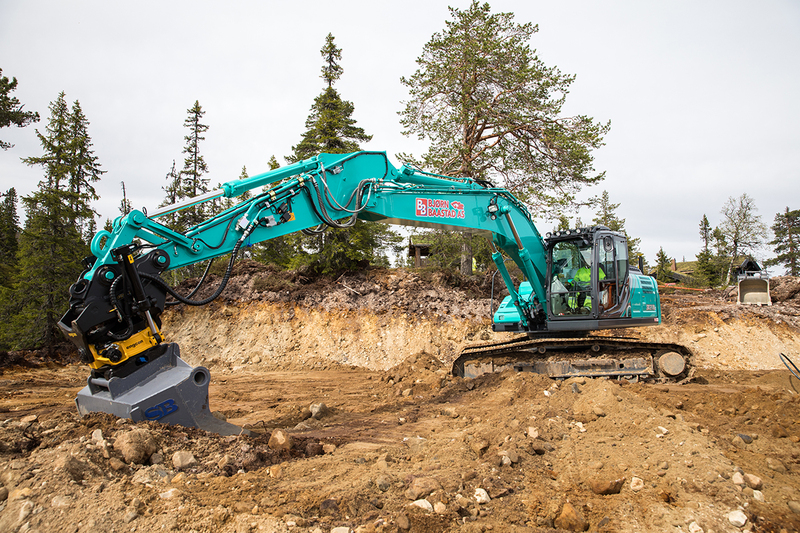 “Not only did Morten like it but there was also the fact Kobelco machines are strong and reliable with good fuel economy – it was an all-round good package. The final choice came down to the service quality from Entrack, the dealer. We have been a customer for many, many years because of the great service. 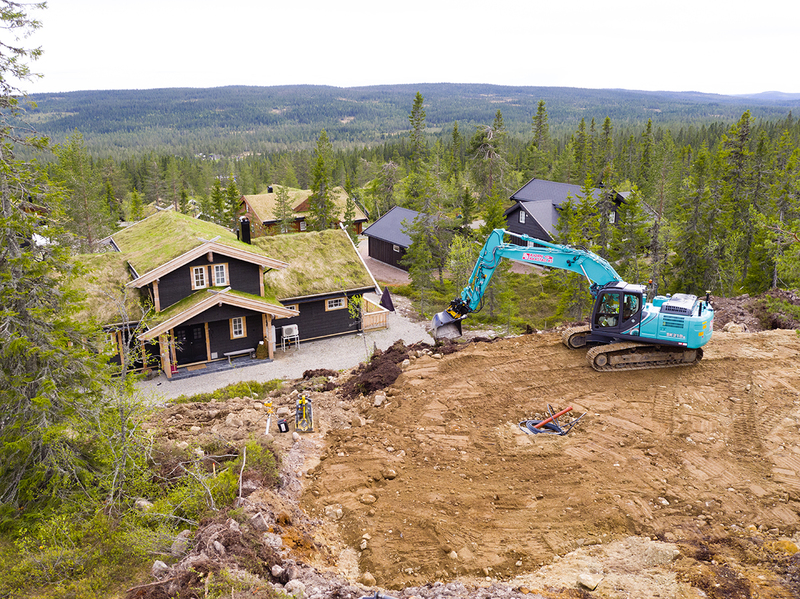 ”Working for Bjørn Baastad AS, Morten is presently applying his operator skills to groundwork preparation – rock clearing and levelling for new holiday cabin units. 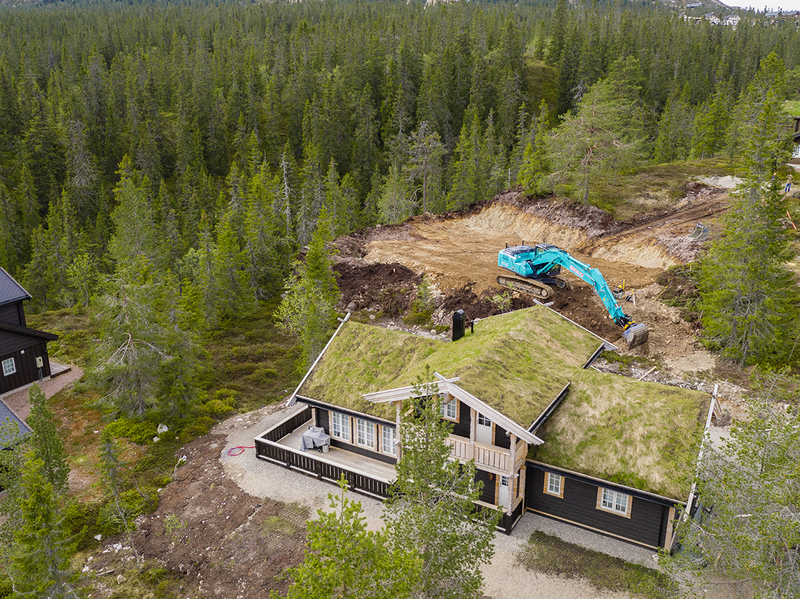 After this, Morten and the SK210LC-10 could move to other groundwork or road construction projects, or be rented out to Norwegian commune infrastructure projects. Morten is one of 15 people employed by Bjørn Baastad AS, which has been in operation since 1995. 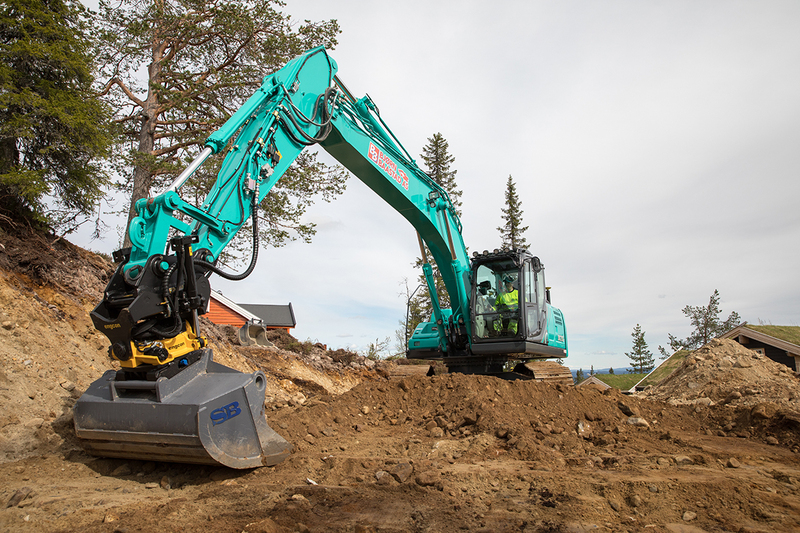 The company has already experienced Kobelco products, having owned an SK200, 907 and an SK75 with over 2,000 recorded working hours, which Bjørn says still works very well. In all, the company operates six excavators, various trucks and wheel-loaders. Would it be right to say Morten and Bjørn are busy men? Most definitely. Three and a half days into ownership and on site, the Kobelco SK210LC-10 looks immaculate, as you’d expect. 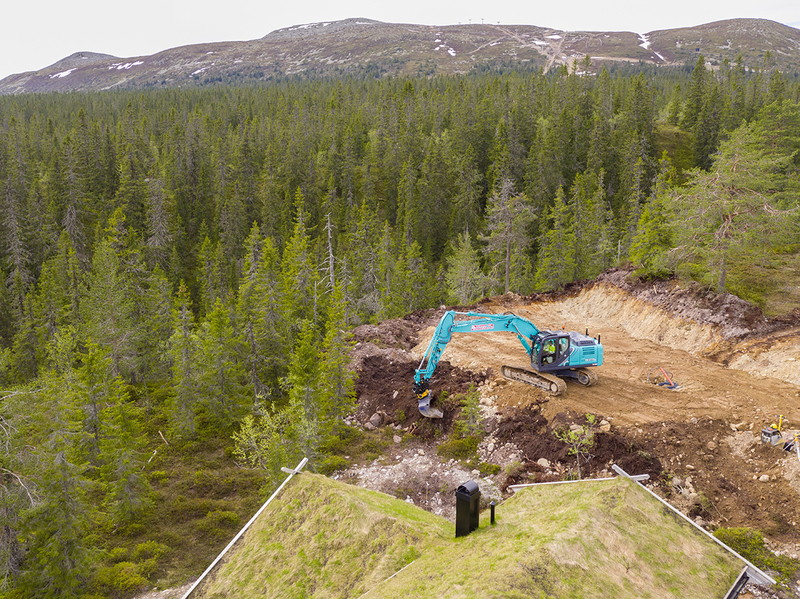 But then it could easily be three years old and still look as good as new – Norwegian excavator operators are, arguably, even more caring for their machines than other operators. When you spend 10-15 hours a day working with a machine it becomes your friend, lodging area and work-mate. For these reasons alone you tend to look after a machine. The high latitude of Norway means the summer days are very long where darkness becomes a memory. Winter is the polar opposite, where daylight is only a few hours and the cold is very, very cold. Because of the diverse conditions, the SK210LC-10 is equipped with a preheating system. Needless to say, Morten highly rates the SK210LC-10. He describes the standard hydraulic system as “excellent” by being smooth and sensitive to give exceptional response. Performance of the Hino engine is also liked. Traversing is spot on with plenty of torque available for all its operating needs. Morten particularly likes the easy access to all the everyday service areas by promptly demonstrating the ease at which he can do this by opening every compartment and pointing to the thought-out layout of the oil filter housing, air and fuel filters and the easy front access to the DEF/AdBlue system. “There is a self-greasing system, too,” says Morten. “Although I haven’t had the machine long enough to know when it will need refilling.” Even so, time spent refilling will still mean less time taken than if manually pumping to every grease point. Excavators in Norway without an accessory tilt rotator at the end of the arm are rarely seen. It is almost as if it is a standard item. The easiest way to describe the work available with a tilt rotator comes from Morten: “With a grab attachment to the roto, the machine becomes an extension of your hand – there really isn’t much you can’t pick up with this system.” With the standard or accessory bucket attached to the roto unit combined with the relatively short dimensions of the SK210LC-10, this excavator can work in tight areas and can dig corners without moving from one spot. In addition, an accessory Leica GPS system has been installed to the SK210LC-10 and recently commissioned. Morton hadn’t used this particular system before but was excited about it. He explained that someone in Bjørn Baastad AS’s head office takes control and draws out all the site dimensions and sends it as a file directly to the on-board GPS system. The system then gives clear dimensions to work to including height, depth and levels. A sensor on the arm talks to others located on the rear of the machine to inform the operator of positioning and levels.